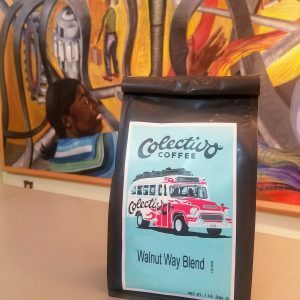 Try our premium Lead From Where You Live – Breakfast Blend, roasted by Colectivo Coffee. We picked this light and medium-roasted coffee blend because it has a rich sweetness and smooth flavor that reminds us of our peaches! 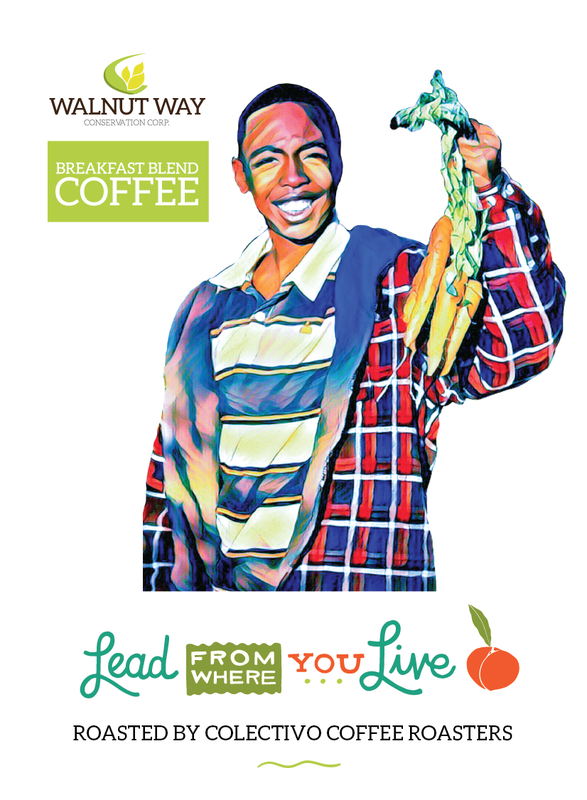 Featured on the Breakfast Blend is Teikani after harvesting carrots from the Walnut Way gardens. Read more about Teikani below. 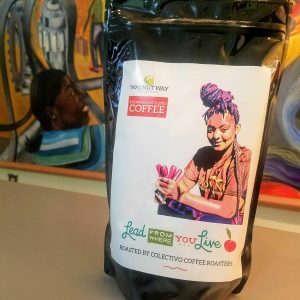 Lead From Where You Live – Breakfast Blend, roasted by Colectivo Coffee. We picked this light and medium-roasted coffee blend because it has a rich sweetness and smooth flavor that reminds us of our peaches! The artwork on the coffee label is inspired by our new EcoTour campus signage that celebrates 18 years of environmental stewardship and civic engagement by youth, families, and elders at The Walnut Way Center. Demonstrations in green infrastructure and urban agriculture by Walnut Way has garnered recognition. This year, The City of Milwaukee designated Walnut Way (and Lindsay Heights) as the first EcoTour Neighborhood. 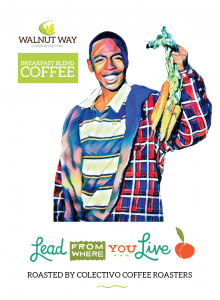 The Breakfast Blend artwork features Teikani who was an enthusiastic youth participant at Walnut Way that loved robotics and making artwork. In Walnut Way’s 4-H Club he learned about composting, gardening, and environmental art. In 2012 he took part in a service day by offering art activities for younger children. He and his peers at Walnut Way were winners in a city-wide video competition, Global Youth Service Day (watch the winning video). As a teenager, he worked in the gardens as a Growing Youth Leadership intern. In 2018, he worked as a young adult at Walnut Way as a Community Mobilization Worker, sharing his passion for the community in which he was raised, by doing door to door outreach and organizing an anti-violence youth poetry event. He was featured in our spring 2018 story. Over the years he has strongly modeled the tenants of civic responsibility and we are inspired to see him lead from where he lives. 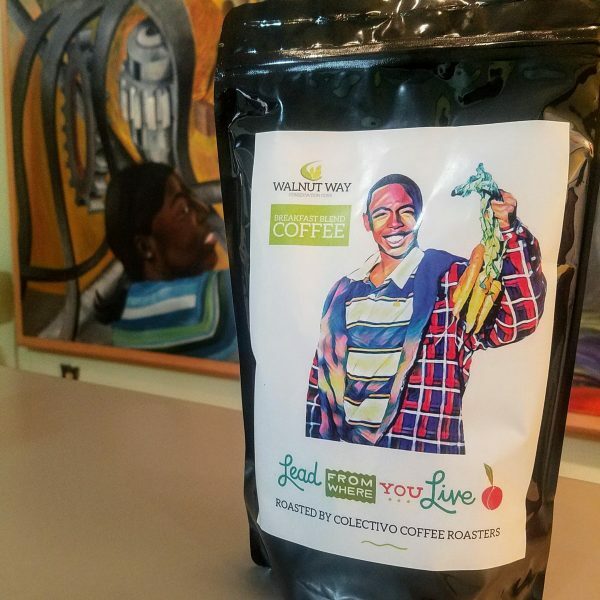 With your purchase of the Breakfast Blend, you will continue to help support Walnut Way’s programs and initiatives and provide opportunities for young people the space for civic engagement leadership opportunities. **Please note, we do not offer shipping. After you make your purchase, please arrange pick up from the Walnut Way office December 18th – December 21st. Contact Erica Heisdorf-Bisquerra at erica@walnutway.org or call 264-2326 ext. 24, Monday through Friday 9:00 a.m. to 5:00 p.m.